Rob & Tina, 10 Year Vow Renewal - Howarth Photography Ltd. Rob & Tina had contacted me months out to book a date for their vow renewal. They were celebrating 10 years of marriage and wanted to do something special, in a special place. They settled on the Hamilton Princess Beach Club which is a very new and exciting location. Things didn’t start off so well when the day finally arrived. They suffered some room issues back at the main hotel which delayed their departure, that in turn meant they hit rush hour traffic leaving town so by now they were quite late. The really big problem came when my phone rang and on the other end was a frantic Rob. The cab they had jumped in took them to the wrong beach club! They had been dropped off at the Southampton Fairmont Beach Club, I’m assuming the cabbie wasn’t familiar with the newly opened Hamilton Princess Beach Club! Rather than have them try and grab a new cab I jumped in my mighty little van and dashed off to get them, thankfully the beaches are very close so with Rob and Tina finally on site we were able to get the vows underway. What started with a lot of stress and confusion ultimately turned into a perfect session in a stunning location with such a wonderful couple. Below is what I received back from Rob after sending him the gallery, some things just have to be shared! We are floored. Unbelievably beautiful images!!! 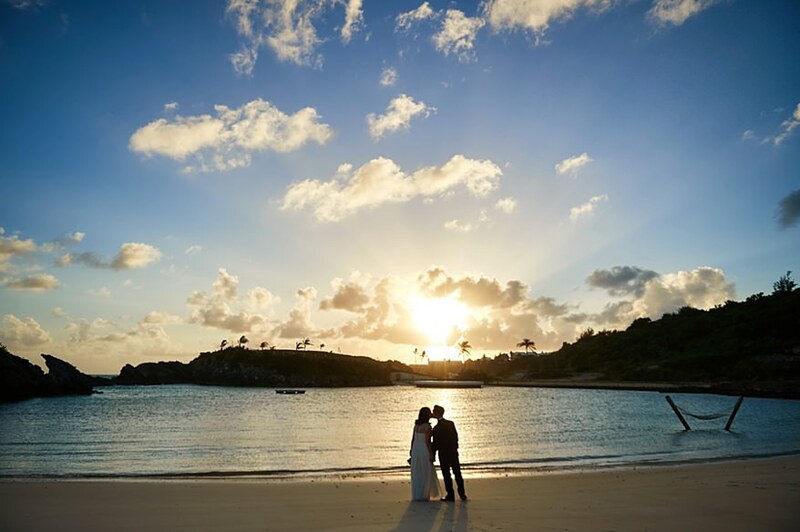 You’ve brought us right back to Bermuda, to the experience, to the wind and the sun on our faces, and the grass and sand, the hilarity of trying to get to the venue on time… and now we can keep those memories forever! From a comfortable shoot to seamless online experience (seriously smooth and easy to use), and the beauty of the images themselves, you’ve surpassed our expectations on every level, and for that we truly thank you! We’re excited to share the online gallery with our family and friends, and have downloaded the image bank of hi-res files (SO many great shots). We’ll be enjoying these throughout the year. Until we meet again (and if we are in Bermuda again, we sure will look you up, and recommend you to all of our friends traveling down there! ), we’ll be following your work on instagram and wish you the best in your business!